Our theory of change shows the change we hope to make in Southwest Minnesota. 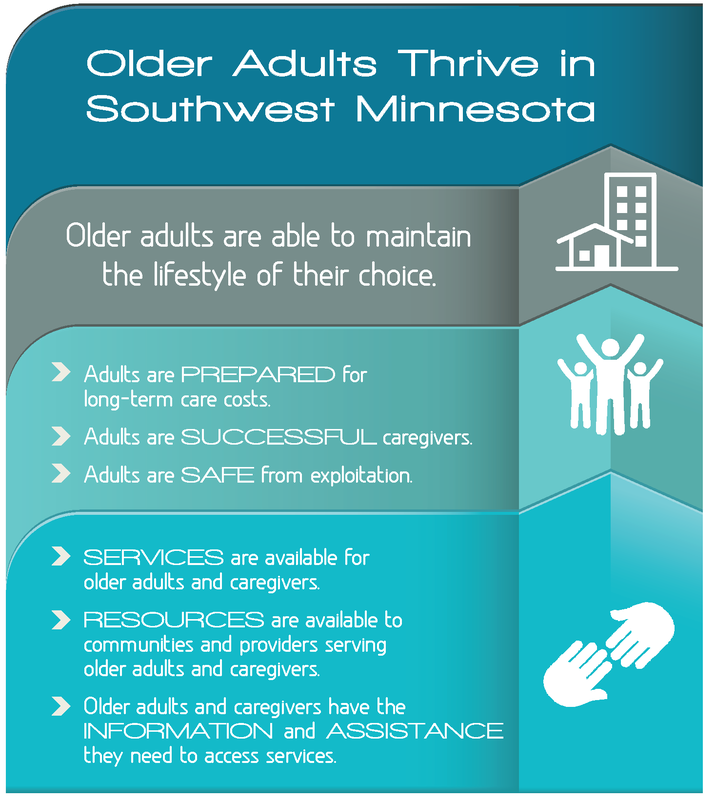 At the Minnesota River Area Agency on Aging (MNRAAA), our work helps older adults thrive in Southwest Minnesota. We believe that older adults thrive when they are able to maintain the lifestyle of their choice. We want adults to have choices as they age. Older adults who are prepared for long-term care costs; who are safe from exploitation; and who have caregivers in their lives have more choices for how they wish to live. MNRAAA is the gateway to resources for older adults, caregivers and service providers in the twenty-seven counties of southwest Minnesota. We strive to ensure that services are available for older adults and caregivers by helping our communities and providers access resources. We also provide information and assistance to help adults find and use those services. Older adults are able to maintain the lifestyle of their choice. Adults are PREPARED for long-term care costs. Adults are SAFE from exploitation. SERVICES are available for older adults and caregivers. RESOURCES are available to communities and providers serving older adults and caregivers. Older adults and caregivers have the INFORMATION and ASSISTANCE they need to access services.